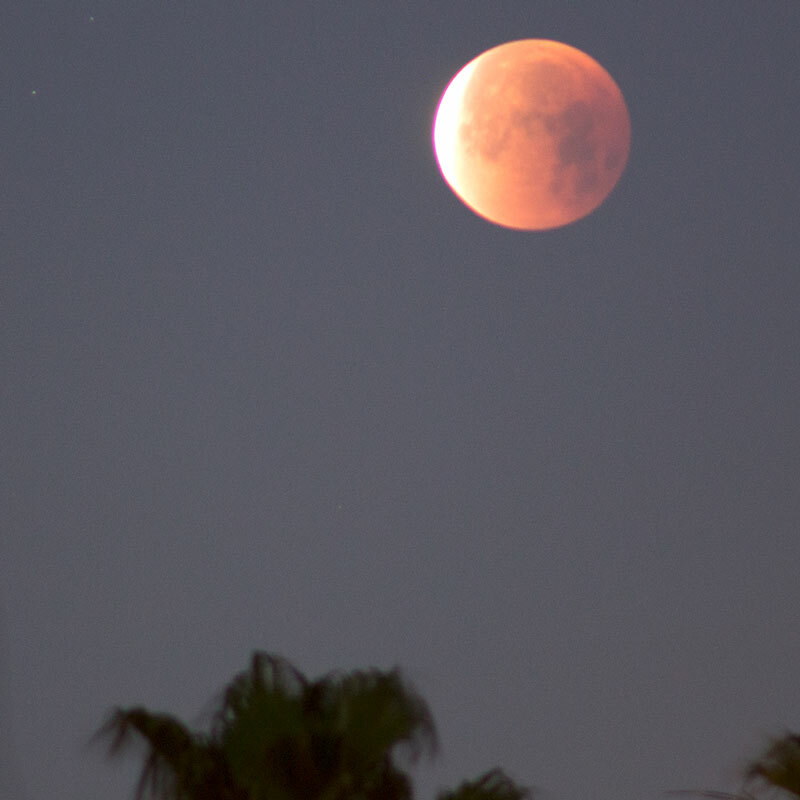 Ok, the day of the total lunar eclipse has finally arrived, and hooray, the weather was perfect this morning. 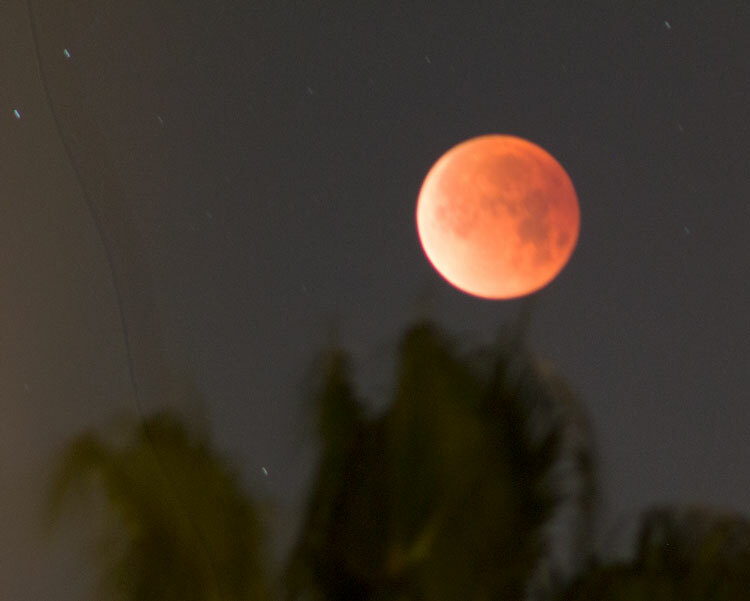 This post has images of the eclipse and an image of the near full moon from the night before and some images that indicate that, yes, we can collect multi-star spectra from one observation. So, I drag myself out of bed at about 4:00AM on January 31 and make a cup of coffee and carry the tripod and camera outside. I elected not to use the tracking mount or the lightweight Sky-Watcher RA tracker either. I'm set up and take this first photo at about 4:22 AM. 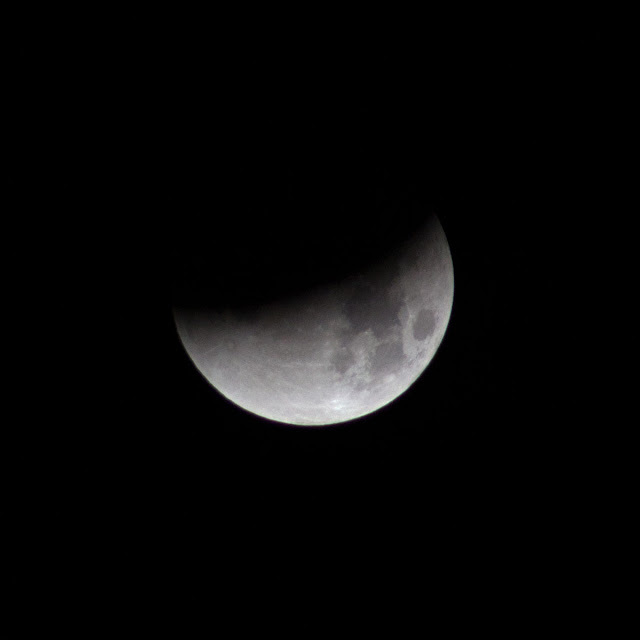 Now it is just a waiting gam as the Earth slowly blocks more and more light from the Moon. This next image shows the bright crescent getting smaller and smaller. I found I could keep increasing the exposure time to capture more and more of the darkened moon. Finally, around about 5:50 AM, the moon is continuing to get dimmer and dimmer, but it is also beginning to slip below the trees from my observing location. Oh-oh, I'm going to have to move if I want to get the moon at its darkest and dimmest. Ok, moved to a site where the trees and rooftops don't block my view of the view. 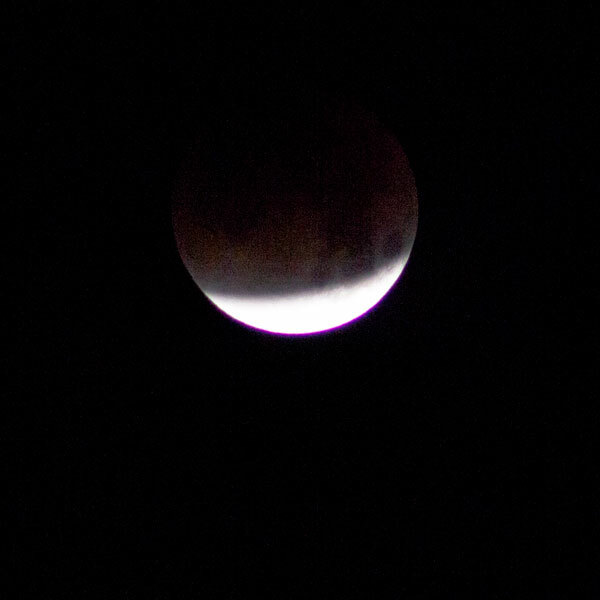 Well as the Earth/Moon configuration in space keeps changing, the eclipse starts to come to an end. One of these days I am going to have to look at calculating the positions during and eclipse and be able to show why the crescents end up as they do; first beginning at the top of moon's image and finally now beginning to get bright at the left hand side. 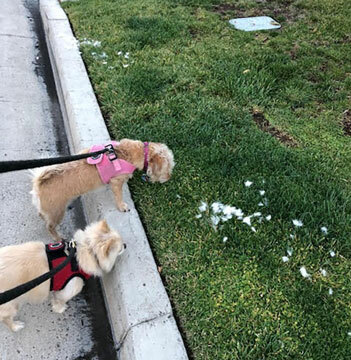 After the moon went below the horizon and after carrying everything back inside, the Astronomer Assistants, Ruby and Danny, were ready to see what they could make of this special eclipse morning. Well, it turns out they did not care about the eclipse at all, but the leftover cottontail rabbit fur caught their attention right away. This bunny, nothing else to be seen, must of been a good meal for the local coyotes. Anyway, enough about coyotes and their breakfasts, the following image of the near full moon was taken the night before the eclipse and is presented here for reference. I was trying to do some comparison between f/stop settings and instead of my usual 300mm lens setting of f/5.6, I tried f/16. 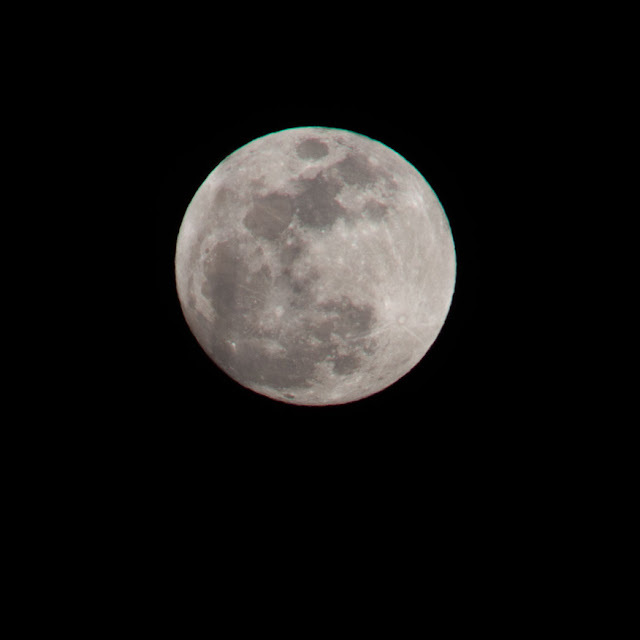 Unfortunately, I forgot or misplace the image of the moon taken with f/5.6. 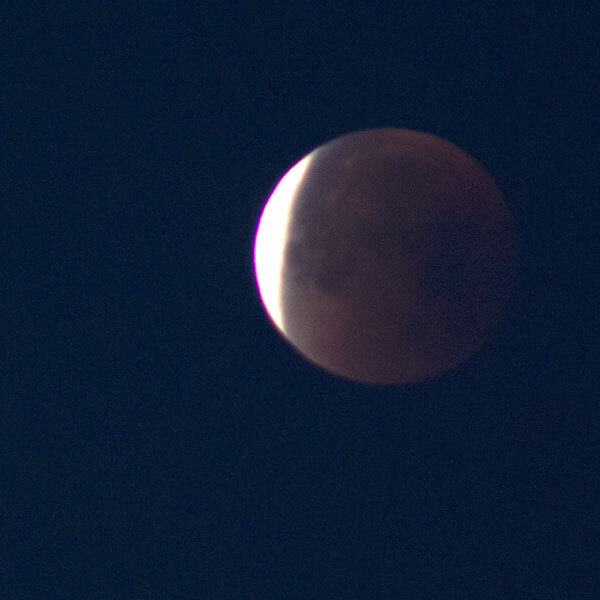 Also, the night before the lunar eclipse was another opportunity to gather some more spectroscopic images. 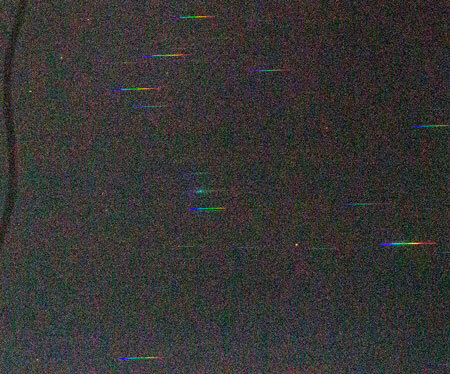 The plan was to fix the lens focal length and then take an image of the reference star, again, Sirius was up and bright. Check out the cropped image of the spectrum below. 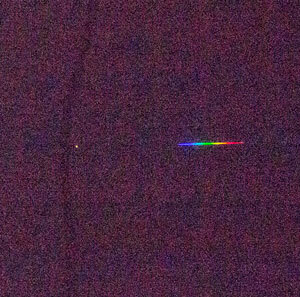 Recall that the bright spot to the left of the spectrum, is the 0th order of the diffraction grating and is the actual image of the star. The spectrum to the right is the termed the 1st order spectrum. This type A star will provide the scale factor to convert pixels to wavelength in subsequent images taken at the same focal length. Luckily, a convenient target, that was up at this time, is the constellation Orion. The image below, taken by pointing the camera with SA-100 installed at the location near Orion's belt. I can see at least 8 instances where the star's spectra seems readable. Also, hey, is that Orion's nebula in the image too? I hadn't thought about getting spectra of nebula with the SA-100, but it seems it is going to be possible. 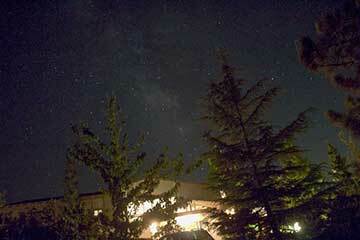 Next time, I'll use the 300mm lens and take long enough exposure to check out the nebula. It might be the case that I will need to use the tracking mount to see the dim nebula spectrum. We will have to wait and see! location of the galaxy will overlap with those from another part. You will probably need a slit! Finally, we just heard that the launch of the Falcon Heavy has been delayed at least one day due to a faulty sensor. Oh-oh, this bad news might put our existing airline tickets at risk. Should we change our tickets and delay our flight or take a chance that the launch will go on Wednesday? Any gamblers out there or close associates of Elon Musk that can help us assess the odds? Maybe we need to get a timeshare there if this delay, normal as it is for space flights, keeps up! The longer the delay the bigger my bar bill!